Instead of going out and consuming resources by buying a ton of new clothes, you can get a new wardrobe simply be swapping clothes. No new resources are consumed. Would you rather drop $300+ at the mall, or get a ton of new clothes for free? I don’t know about you, but going to the Salvation Army takes a lot of time. You have to dig through a ton of bad ’80s blouses with shoulder pads to find that James Perse t-shirt you’ve been craving, if you ever find anything at all. But think about your friends…chances are they have styles similar to yours. This means that you don’t have to dig through a whole warehouse full of junk to find great stuff. Hosting a clothing swap means that you get to hang out with a group of your closet friends, digging through clothes. As you can see, clothing swaps are just a good, fun way to get some new clothes and live a little lighter on the earth. But how do you host one? Pick a Saturday about 4 weeks from now, and send an invite to all the friends you’d like to have over. Ask your friends to bring at least a garbage bag full of unwanted items. Let them know items should be clean and folded for the swap party. Don’t put up any other barriers, though. You never know what someone will want! 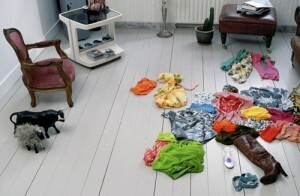 Bags, shoes, accessories, dresses, pajamas…all are fair game to bring to the clothing swap. Be brutal here. If you haven’t worn it in a year, then chances are you’re not going to. Only keep clothes that you love and make you feel beautiful. Clothing swaps are a chance for you to connect with your friends. So why not turn it into a real get-together? Make appetizers, open a bottle of fair trade wine, and invite your friends to bring a dish when they come. This way you can swap clothes, snack, and have a wonderful time just hanging out. Make sure there is a table for every major type of clothing (pants, t-shirts, shoes, etc. ), and label them with a sign so your friends know where to stack their clothing once they start arriving. This will help keep the room organized as the clothes start flying around! Some of your friends might not be comfortable changing in front of everyone else, locker-room style. Make sure there is a comfortable room that someone can use for trying on clothes. If there is any clothing left over at the end of the clothing swap, donate it to your local Salvation Army or women’s shelter. Tip: You can also open up the clothing swap party for maternity, baby/kids clothes, and mens clothing. Your friends can grab anything they think will fit their family. Clothing swaps are a wonderful way to get “new” clothes without using up the resources of buying something new. And, they’re a fun way to reconnect with your friends. Have any of you ever hosted a clothing swap? Was your swap for close friends, or for the general public? I’d love to hear about your experience if you’ve hosted one before! Thanks for sharing, I found this story while looking for lyrics, useful comments and great points made. Hey may I reference some of the insight from this entry if I provide a link back to your site? My son just turned one in April. I have been trying to find some different foods for him to eat for lunch. The problem is that somedays he will eat something with no issue and the next day he throws it on the floor. I just want to be able to change things up for him. Does anyone have any ideas? What do you feed your little ones for lunch?? Any thoughts would be appreciated. I have to say, I enjoy reading your article. Maybe you could let me know how I can subscribing with it ? Also just thought I would tell you I found this site through google. I recently came accross your website and have been reading along. I thought I would leave my first comment. Nice blog. I’ll keep visiting this weblog often. R¨¦elles succ¨¨s vient petit pi¨¨ces jour apr¨¨s jour. Vous devriez faire plaisir de la vie tous les jours peu tr¨¦sor doudoune moncler http://doudoune.seesaa.net/ doudoune monclerJe suis tout le temps ¨¤ la recherche de r¨¦troaction…. Hi there thanks for the quality post, i had a good read,http://yanjijie.blogtrue.com/page.view.do?pageID=1847 , thank you for your article,My problem has been resolved….